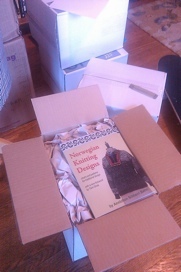 The first copies of Norwegian Knitting Design arrived today. My printer made a special 45 minute trip to deliver about 250 copies that I can ship to my retail buyers while we wait for the special ordered case boxes from the manufacturer. Self publishers, or even if you’ve ever considered self publishing, call Vincent at Snohomish Publishing. He is terrific. Preorder buyers, I should have all orders shipped next week. Thank you so much for your support. Norwegian Knitting Designsis a smallish book, about 7X9″ but packed with amazing charts taken directly from traditional Norwegian knitters. Please order your copy today and help continue this wonderful tradition. I’m exerpting and updating a beautiful sweater pattern from NKD for Piecework Magazine. My book sample is beautiful, but I didn’t really follow or write a pattern. I just winged it. I’m knitting another sample and documenting what I do this time. 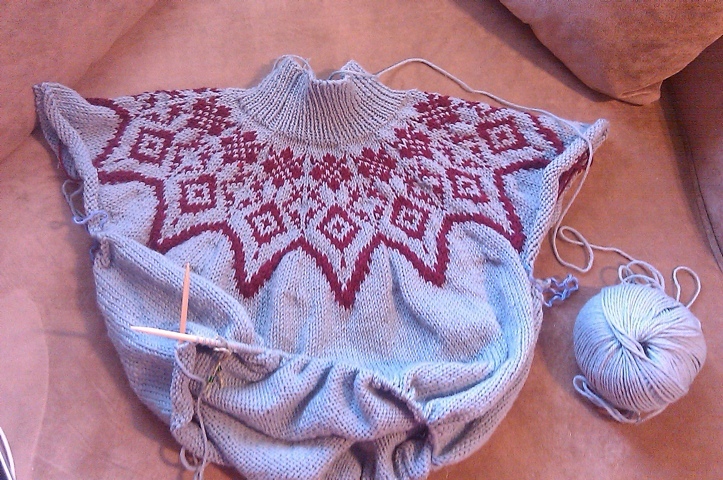 I believe this design, first published in URD Magazine, a Norwegian publication, is the first documented pattern for a top down yoked sweater. I have read rumors and seen photos of the Knitting Madonnas, knitting Jesus’ seamless garment, and it is shown as a sweater knit in the round. If anyone knows more, I’d love to hear from you. OH YEA!!!! I’ve been waiting and waiting!! Loving the sweater design too. Can’t wait to see in in real life. I finished Jayda’s Leopard and stripe dress….on my blog. SO excited about the book…. Congratulations on your most recent book! I was really excited to see that you are planning/thinking about a book on the history of yoked sweaters. Like you, I have heard that Annichen Sibbern-Böhn’s Eskimo sweater (inspired by the netted, beaded yoke of the female Greenland national costume) is the first example of a yoked sweater and that the next one to make a splash was the Bohus Stickning Blue Shimmer from 1947. I’ve seen pictures of some of the knitting Madonnas but I don’t recall those garments having any kind of patterning around the yoke. Anyway, the book project sounds really interesting. How fascinating about the knitting madona! That is correct, the “traditional” Icelandic sweater is quite recent. However it’s quite unclear who started it first; they were a few women ( I interviewed some of them) who started knitting yoke sweater and soon they develop their very own patterns for what become the most popular sweater in Iceland. Auður Laxness ‘s words have been very much discussed in Iceland: she may have suggested Istex to work with such sweaters an publish the Lopi magazine (Istex doesn’t confirm the story) but she certainly didn’t start them. Can’t wait to see the new book! I’m thrilled you’ll be teaching at Sock Summit. Are you staying with me? I never had lime curd before but I'm sure I'll enjoy this. I love the sharpness and freshness of limes.And I never made any curds before, it's something I'd like to try. Hi there, this weekend is nice designed for me, since this time i am reading this impressive educational article here at my house.